Updated look to match WSA PC/Mac release. No other changes. I'm able to sign in myself without doing anything special, so if it is a bug, it's not happening for everyone. What is the full text of the error message? Are you using the right gmail address when logging in? We have two email addresses on file for you. On second attempt, it actually does reproduce for me. I was using the stand-alone SecureWeb rather than the one that comes with Complete. If you use the standalone version, does it let you in? I've spent the last hour or so trying to figure this issue out. It does look like a defect to me and a developer I roped into the conversation, so at this point I'm going to get the problem escalated it to development to see what can be done. Good catch Pegas. The stand-alone version did not get an update. The updated version alone that comes with Complete has the issue. The workaround for the time being is to use the stand-alone version instead, which can co-exist with Complete. 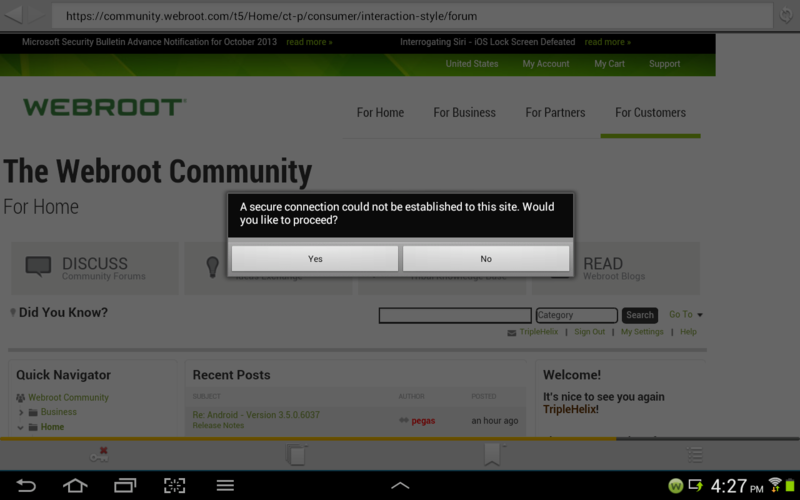 Works fine here on my tab 2. Free WSA-AV & Standalone SecureWeb Browser. Jim, cannot login to SecureWeb. It data check internet connections or something similar. However I am logged in Backup & Sync and WSA itself. It looks like a bug. Request failed! Check you connection. Yes, using the same gmail address as for WSA and Backup & Sync. And this address was successfuly used also for SevureWeb until today's update. I am always trying all functions, settings, logings etc. after main upgrade of an application, including WSA. I am glad that you could reproduce this issue thus much easier for developers to tackle. And, yes in reply to your previous post, I am using WSA Complete where SecureWeb is bundled, so I have .6037 across all WSA components on my Android.